The mission of Campus Safety is to provide a safe and welcoming environment to enhance the well-being of student, faculty, staff and visitors and protect all College property. The Campus Safety Department strives to achieve this mission by means of a community-friendly approach that enhances safety through the visibility of security personnel, preventive patrols, and positive conflict resolution. RCTC Campus Safety collaborates with local law enforcement and community organizations in fulfilling its mission. Campus Safety is located on the first floor Coffman Hall, room 102. Campus Safety will summon Emergency Medical Services (EMS) if needed or requested to do so. Campus Safety does not transport injured or stricken individuals to hospitals or emergency care centers. If an emergency arises on campus, call Campus Safety using a regular college telephone by dialing 7262. If you do not have access to a regular telephone and there is an immediate need for police, fire or ambulance response, activate any emergency Code Blues located in the parking lot. By pushing the large red button, you will be put in touch with RCTC’s 9-1-1 system. Again, only activate an emergency Code Blue if police, fire or ambulance response is required. Campus Safety maintains a lost and found service for the campus community. Report lost items and turn in items that are found unattended to the Campus Safety Office. Found property will be held until the end of each semester. All unclaimed items will be donated or destroyed. Lost and found can be contacted at 507-280-5050. 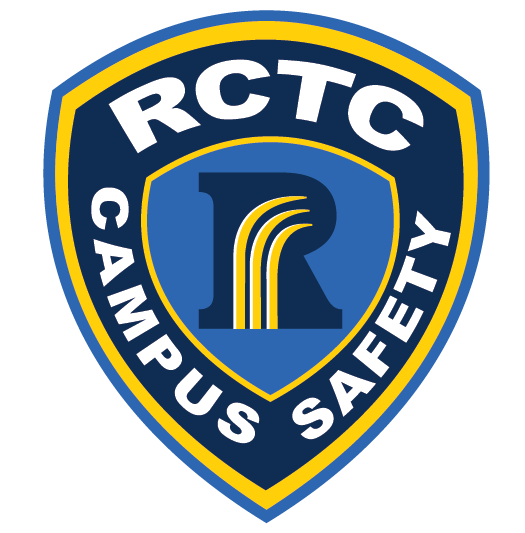 Parking and vehicle regulations are in place at RCTC to ensure the safety of students, faculty, staff, and visitors to the College. Campus Safety issues parking permits (including temporary and vendor) and will answer all questions regarding parking and vehicle regulations. Parking is monitored and vehicle regulations enforced by RCTC Campus Safety. Although general security patrol is provided, you are advised to lock your vehicle at all times and to secure valuables out of sight. RCTC is not responsible for damage, loss, or theft of vehicles or other property of those using College facilities. During emergencies or other special circumstances or events, Campus Safety may establish and enforce temporary parking and vehicle regulations deemed necessary. Parking regulations have been adopted for the benefit of students, faculty, staff and visitors, and to enable Campus Safety to manage a heavily trafficked campus. Parking is defined as the standing of a vehicle upon any property owned or controlled by the College whether accompanied or unaccompanied by an operator for more than one minute. Parking in a space or area specifically designated with a “reserved” sign. No person shall park in handicap designated parking areas unless registered with the State of Minnesota and displaying an appropriate placard. There are two designated Faculty/Staff areas that students and visitors are not allowed to park. These areas are located in the East and West parking lots of main campus. Signs are displayed in this area showing the designated Faculty/Staff parking spaces. RCTC requires the registration of all motor vehicles on campus that are operated by faculty and staff when such vehicles are operated or parked on the College campus. Faculty and staff permits are issued on a permanent basis and are for the exclusive use of the faculty or staff member to whom issued. Use of the permit by others is prohibited and may result in revocation of the permit. Students and visitors are not required to register their vehicles. Students, faculty and staff charged with a violation shall pay the appropriate fine by making payment (in person or by mail) at the Cashier’s window within 10 days of the violation. Unpaid tickets will be filed for collections, and students’ accounts will be frozen.